The five-story, mixed-use project development project at the site of the former Central State Bank at the corner of North Linn Street and East Market Street is set to be completed and opened by November 2019. The first-floor space is set to host a restaurant and the next four floors to house a series of condos. A half-staircase on the first flood will lead to a mezzanine level for a smaller, complementary commercial space. Plans show a two-level, townhouse style condo will stretch between the second and third stories, surrounded by four one-bedroom condos on each of those floors. Plans show three larger condos will fill the fourth floor and on the fifth, two large penthouse condos. The rooftop terrace will include two lounge areas, a planned breakfast bar and catering prep area, and a bocce ball court, all surrounded by greenery planters.The project also includes seven parking spaces and six moped spaces underground. Freund-Vector Corporation is evaluating the opportunity to construct a new Technology Center that would improve their laboratory capabilities and increase research and development activity. The company designs, manufactures and services a wide range of equipment for the processing of powders, particles, tablets and other solid materials to the pharmaceutical, nutritional, food and other industries. Freund-Vector’s unique in-house laboratory facility specializes in product feasibility, process development and process technology to support the marketing of all Freund-Vector product lines. The board awarded the company tax benefits from HQJ to develop new products/process with latest model equipment and increase visibility in the industry via the new center. This $6.4 million capital investment is expected to create five jobs incented at a qualifying hourly wage of $24.91. Van Meter Inc. distributes automation, electrical, data communication, lighting and power transmission products. The company serves the agriculture, commercial, contractor, education, food and beverage, healthcare and manufacturing industries. 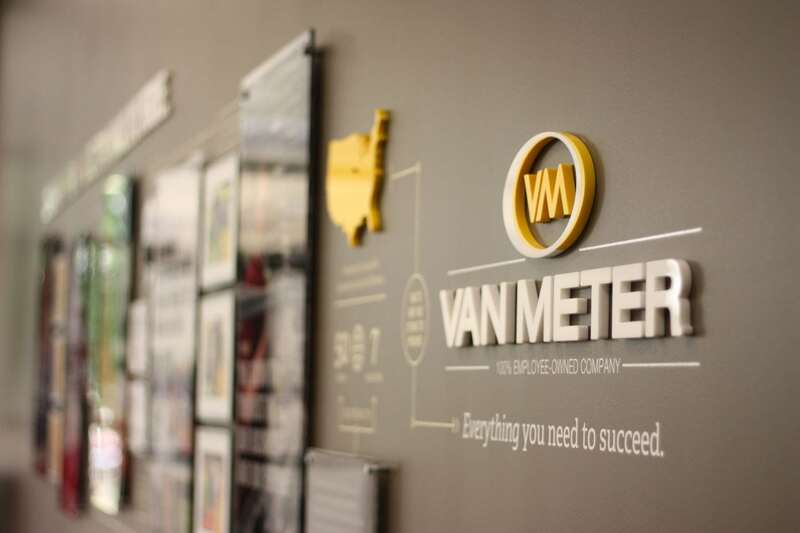 Van Meter Inc. plans to expand its current facility in Cedar Rapids to add shipping and receiving docks, as well as expand existing warehouse space. This project represents a $4.7 million capital investment and is expected to create 21 jobs, of which three are incented at a qualifying wage of $24.91 per hour. The company was awarded tax benefits via the HQJ program. Timberline Manufacturing, located in Marion, is an employee-owned company that provides electrical contract manufacturing specializing in wire harness assembly, control panels and circuit board assembly. Timberline plans to purchase the facility it is currently leasing along with adjacent land, construct an addition and remodel existing space. This significant expansion will allow Timberline to meet increasing demand from current customers. The board awarded Timberline tax benefits from HQJ for this $12.7 million capital investment. The project is expected to create 56 jobs, of which six are incented at a qualifying hourly wage of $24.91. World Class Industries, Inc. (WCI) is a contract assembler of modules and products for Original Equipment Manufacturers, working primarily with off-road equipment manufacturers. The current Hiawatha facility cannot accommodate its growth and need for additional staff. WCI plans to construct an additional 50,000 square foot office and warehouse space on 13 acres. The board awarded WCI tax benefits from the HQJ program for this $7.9 million capital investment. The project is expected to create 28 jobs, of which 16 are incented at a qualifying wage of $24.91 per hour. Goodwill of the Heartland would hire 40 people, most of whom would have disabilities, to package vegetable oil under a new federal contract worth at least $18 million a year. Seed company DuPont Pioneer will be the sole tenant of a new, 200,000-square-foot warehouse in southwest Cedar Rapids. Congratulations to the Orbis Corporation for choosing Monticello for their expansion project. A groundbreaking ceremony was held to recognize their addition of 100,000 square feet, more than doubling their current footprint. Jones County is fortunate to have a diverse and successful manufacturing base. GEICO’s new two-story, 50,000-square-foot office offers a design that emphases windows and an abundance of natural light and space to continue to grow, all highly visible and accessible from Interstate 380. Modern, mixed-use buildings in the heart of ICR, with a pedestrian plaza and greenspace and retail, all accessible to a fast-growing town and the greater region. The first comprehensive high school built to serve the Iowa City Community School District in nearly four decades, it offers state-of-the-art faculties with collaborative-learning and maker spaces. Named after the University of Iowa’s first female athletics director and legendary Title XI advocate, Grant will open in 2019 to 400 students and become the newest elementary school in the Iowa City Community School District. College Raptor is a digital platform that provides prospective students, parents, high school counselors, and college enrollment managers resources to resolve challenges related to college planning, financing and enrollment. College Raptor enables students and families to discover appropriate college options based on personalized estimates of financial aid, scholarships, academic match and acceptance chances at every four-year college in the country. The Iowa City-based company was awarded a $300,000 Propel loan from the Iowa Innovation Acceleration Fund for market planning and market entry activities and hiring key personnel. CIVCO Medical Solutions, a leading manufacturer of ultrasound guidance devices and infection control products, plans to expand its Multi-Modality Imaging business at its Iowa facilities in Coralville and Kalona. CIVCO’s Multi-Modality Imaging (MMI) business offers a broad range of solutions and products for radiology, regional anesthesia, vascular access, men’s and women’s health, cardiology, surgery and critical care. The company is proposing an expansion of its corporate office in Coralville to accommodate future business growth. The board awarded the project $100,000 in direct financial assistance as well as tax benefits for this $1.1 million capital investment. The expansion will create 20 jobs, 13 of which are incented at the laborshed wage of $24.19 per hour. Growth Street Partners and existing investors, including Village Capital, Hyde Park Venture Partners, and AOL Co-Founder Steve Case/Rise of the Rest, have made a $4.0 million growth equity investment in Pear Deck, a provider of real-time classroom engagement SaaS. Pear Deck’s software enables K-12 teachers, schools, and school districts to engage students, improve educational outcomes, and enhance the teacher experience. Walsma & Lyons, Inc. is a wholesale distributor of fresh fruits and vegetables, representing growing shipping districts from across the United States. The company is under contract with a major national food service company to set up a fresh produce distribution hub to service several distribution centers. These centers are located across the Midwest, including a facility in Iowa. The company plans to improve an existing building in Cedar Rapids, making it usable for fresh produce distribution. This project represents a $300,000 capital investment. Walsma & Lyons was awarded tax benefits via HQJ. The project is expected to create 22 jobs, of which two are incented at a qualifying hourly wage of $24.70. On August 8, Cedar Rapids Mayor Ron Corbett and City Manager Jeff Pomeranz welcomed the City’s newest employer, Sedgwick, to downtown Cedar Rapids with a ceremony at Eastbank Venue & Lounge. The celebration highlighted the opening of Sedgwick’s new location in the Smulekoff’s buildling and introduced the new business to the Cedar Rapids community. Sedgwick Managing Director Tammy Worthey regarded how beautiful downtown Cedar Rapids is and that the business expects to expand in Cedar Rapids by 25-50 employees per year. Sedgwick will bring 40 new jobs downtown. The Economic Alliance and the City assisted with site selection and hosting of decision makers last September during their location selection process. Purchase and Renovation of the American Building. Weems Industries, Inc., d/b/a Legacy Manufacturing Co., has been operating since 1986, offering a wide-range of professional grade service and maintenance equipment for automotive, industrial, contractor, agricultural and marine markets throughout North America. Legacy’s Flexzilla® branded hose products have opened up markets for the company in the lawn and garden and outdoor power categories. The company is proposing a 200,000 square-foot expansion of its current facility in Marion to allow for continued growth. The board awarded the project tax benefits via HQJ for this $12 million expansion that will create 13 jobs, one of which is incented at a qualifying hourly wage of $24.91. Headquartered in Norway, Iowa, Frontier Natural Products Co-op has been a leading supplier of organic herbs, spices and aromatherapy products since 1976. The co-op’s products can be found in mainstream grocery, natural product, and online retailers throughout the United States and Canada. The board awarded the company tax benefits via HQJ to construct a building for flammable storage, an Innovation Center and to improve sustainability initiatives. The project has a capital investment of $3.1 million and will create two jobs, of which one is incented at a qualifying hourly wage of $24.91. Additionally, seven jobs will be retained at the same qualifying wage. Highway Equipment Company (HECO) was founded in 1939 and manufactures deicing spreaders and road maintenance equipment, along with agricultural equipment, such as crop nutrient applicators. HECO’s Hi-Way and New Leader brands serve growers and ag retailers as well as municipal customers and contractors across the country. HECO is proposing to build a facility in Cedar Rapids that will allow for testing of spread patterns year-round, allowing the company to expand the research and development capabilities. The project has a capital investment of $1.35 million and will create 14 jobs at a qualifying wage of $24.91 per hour. The board awarded the project tax benefits via HQJ for this expansion. Crystal Group is an employee-owned company that designs, manufactures, integrates and supports rugged computer-based systems for intelligence and critical control applications in government and industrial segments. Crystal Group has out-grown its current building and additional space is needed to meet revenue demands. The project represents an $18.6 million capital investment and includes a new office and manufacturing facility within Hiawatha. The board awarded the company $100,000 in direct financial assistance as well as tax benefits via HQJ. The project is expected to create 45 jobs, of which 20 are incented at a qualifying wage of $24.70 per hour. Lil’ Drug Store Products is the number one supplier of health and beauty care (HBC) products to the convenience store channel. The company markets a complete assortment of HBC products to over 100,000 convenience stores across the U.S. Additionally, the company’s category management services business delivers insights and analytics to over 45,000 convenience stores across the U.S. The company is building a new distribution center and office in Cedar Rapids to serve as the company’s headquarters. The board awarded the company tax benefits via HQJ program to create 11 jobs, eight of which are incented at a qualifying wage of $24.70 per hour. The project will have a capital investment of $13 million. Cedar Ridge Vineyard, LLC, located in Swisher, produces distilled spirits, primarily whiskey and wine. This project includes the expansion of the existing distillery and still house to increase production, the addition of new equipment and construction of additional warehousing to hold aging spirits. The board awarded Cedar Ridge tax benefits from HQJ for this $2 million capital investment. The project is expected to create six jobs incented at a qualifying hourly wage of $24.32.